Aiello Home Services can guide you through the process of your water heater replacement. We will help you with choosing the right style and size of your new replacement water heater and provide you with a professional installation from start to finish. If you’re noticing any of these signs or you know that your water heater is an older model that hasn’t been replaced in the past 10-15 years, it may be time to replace that old water heater with a newer model. We always do our best to make a repair work before suggesting a new water heater installation but sometimes a new water heater is the better option. If you need help with your hot water heater, don’t wait. Give Aiello Home Services a call and we’ll come take a look. We will even provide an upfront quote so you won’t be surprised by the final cost! Click the button below or call now to schedule a professional plumber to look at your water heater today! What Type should you get? Our certified expert plumbers will be able to tell you what type of water heater and gallon size is right for your needs and then get it installed quickly and professionally. We’ll even help you run the numbers to figure out all the costs of replacing a water heater with your best options so you can make the best decision possible. 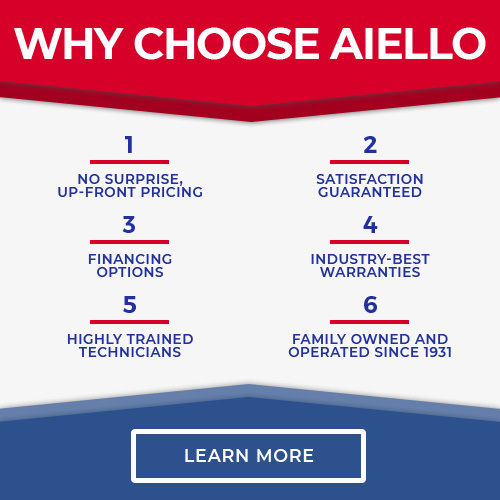 Call now at 888-861-8859 or schedule service online to get peace of mind about your water heater with Aiello today!